Home » Accounting Dictionary » What is Net Present Value (NPV)? Definition: Net present value (NPV) is the current or present estimated dollar value of an asset, investment, or project based expected future cash inflows and outflows adjusted for interest rates and the initial purchase price. Net present value uses initial purchase price and the time value of money to calculate how much an asset is worth. In other words, net present value is the present value of an asset less the initial purchase price. The time value of money concept is simple. Over time money can be invested and will earn interest. A dollar today is worth more than a dollar tomorrow because the dollar today can be invested today and earn more interest than the future dollar. Net present value takes the time value of money concept and applies it to business investments and capital purchases. Take a large equipment purchase as an example. A company is trying to decide whether to purchase a large CNC machine for its factory or lease one. Managerial accountants have analyzed the production capacity of the new machine and anticipate that is will bring in $5,000 of cash inflows every year for the next 8 years. The new machine costs $15,000 and the current market rate of interest is 12 percent. The cash inflows are compounded by the market rate of interest and the original purchase price is subtracted from the total. 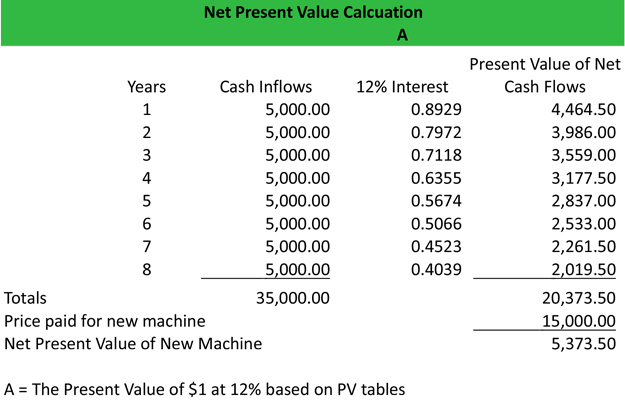 Here is the net present value calculation. As you can see, the net present value of this machine is $5,373.50. This means that the machine will not only pay for itself, it will also make $5,373.50. The general rule of thumb is that if the net present value of an investment or capital purchase is greater or equal to zero, it is a good investment. 1 What Does NPV Mean?